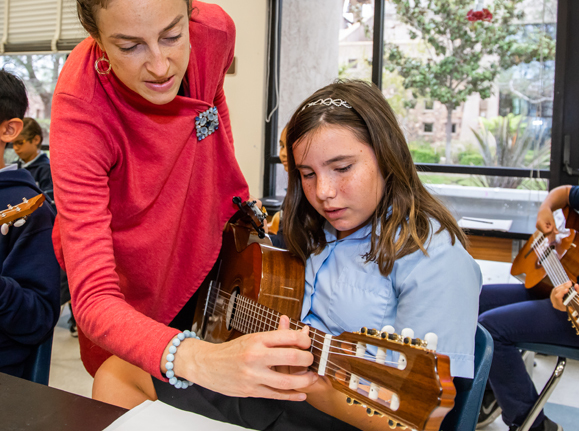 From Guitar Classes To Foreign Languages To Vibrant Art Programs. We have raised the basic school subjects to more than just reading, writing , and arithmetic; we have given our students a learning base of creative thinking that carries through to every subject. Included in our arts program is Music Theory, Guitar, Choir, Art History, classical fine art, and sculpture. The foreign language program includes Spanish and French taught by French Sisters. Teaching these skills in school eliminates the need for afterschool and weekend lessons, and integrates the subject matter into their daily school life. Language Immersion Is At The Core Of NDA’s Cultural Enrichment. ¡Bienvenidos a las clases de español! 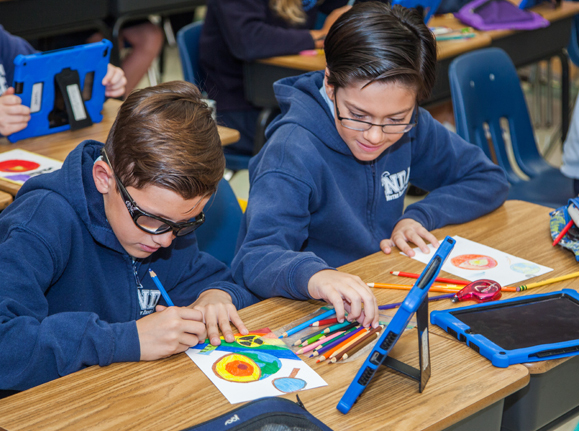 Notre Dame Academy offers a Spanish Initiation Program starting in Preschool through 8th grade. The goal of this program is not only to increase the awareness of the foreign language but also of its culture. This language exposure helps the students become more sophisticated thinkers and have increased listening skills and memory. A wonderful asset of this program is the exciting exchange program which permits children to go to Spain and really live the language they have learned. Bienvenue à la classe de Français! French is taught in Pre-School through 8th grade with the objective to build a solid foundation in communication skills and appreciation of culture. In the 7th grade, our students have the opportunity to attend the Sisters’ school in Poitiers, France. During the week, the students are immersed in French as they attend classes with their French peers, and on the weekends, the NDA students have time to explore Poitiers, and the surrounding countryside with their host families. The program aims to build self-confidence in verbal skills in French as well as developing global citizens. Music To Your Ears And Eyes. There are two main events to showcase student work, a Cafe Night that happens three times a year and an Art Expose in May for all students. We’ve also incorporated art into our STEAM projects showing students how creativity is a key component to innovation. Our music program is an integral part of NDA culture. Once a year we have a music performance where students showcase their musical talents. They have the option to sing or play an instrument and some students have even composed their own music.